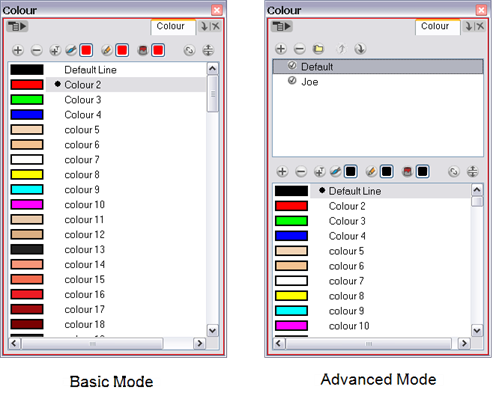 The Colour view has two modes: basic and advanced. The Colour view’s basic mode only shows the Colour list. When you open Toon Boom Animate Pro, you only see the colours available in the default palette. This default palette contains six basic colour swatches and is automatically named the same as your scene. For simple projects, you can manage with the default palette, but for movies, series or shorts it is recommended that you create palettes for your characters. To create a palette, you have to switch to the advanced display of the Colour view and show the Palette list. To create palettes for your characters, you must display the Palette list. Once you display the Palette list area, a series of new buttons appear. 1. In the Colour view, click on the Show/Hide Palette List View button to expand or collapse the Palette List area. • Each palette you add in your scene will appear in the Palette list. • You can add, delete, import and order palettes in your scene using the Palette menu buttons.